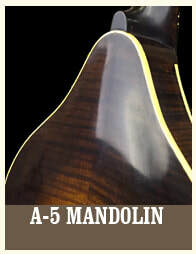 Our Hawthorn® Mandolins are made one at a time using choice wood and the best hardware available. We use Waverly tuners with real pearl or ebony tuner buttons. The popular James tailpiece is standard. Bone nuts are standard and Pearl nuts are available. We favor traditional construction methods such as using only fresh, hot hide glue for all major joints. These fine instruments are available with one or two-piece backs. German Silver spruce (European spruce) is standard for tops but Sitka, Engelmann, or Adirondack red spruce is available upon request. All Hawthorn mandolins feature a carefully hand-applied varnish finish, the mark of truly fine mandolins. Our Hawthorn F-5 style mandolins have earned kudos for playability, tone and volume from our Bluegrass community in the Kansas City area. 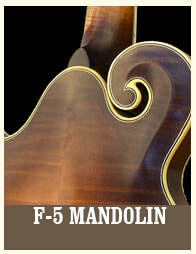 We are now offering these fine mandolins nationwide.